great position, nice staff and a lovely breakfast. Wife loved the pool in the health club. The room is very comfortable. The hotel is near of everything you need. The ladies at reception are very helpful, as well the housekeepers. This hotel is a very good and value relationship. Great location, Friendly staff, Lovely breakfast choices, Comfy bed, Easy check in process. Would recommend to family and friends if visiting the area. Definatly would stay again! The location was excellent. The room was great for our dog staying with us as it had a balcony where she could sit and watch the world go by.staff were friendly and helpful. The Queens Hotel and Spa This rating is a reflection of how the property compares to the industry standard when it comes to price, facilities and services available. It's based on a self-evaluation by the property. Use this rating to help choose your stay! 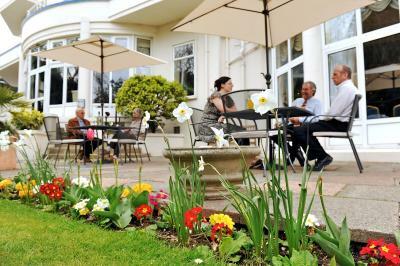 One of our top picks in Bournemouth.Just a few hundred yards from Bournemouth's sandy beaches, The Queens Hotel has spacious, traditional rooms. There is a relaxing pool and spa, a gym and an award-winning restaurant. The vibrant town center, Bournemouth International Center and the Pavillion Theater are all within 15 minutes’ walking distance. Forever Gorgeous Spa has a wide range of specialist beauty and health treatments - appointments are strongly recommended. 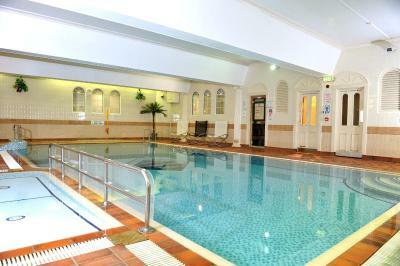 Leisure facilities also include a gym, steam room, sauna and spa bath. Bedrooms have 24-hour room service, and some have a balcony or partial sea view. Each features a TV, tea/coffee-making facilities and a private bathroom with complimentary toiletries. The Queens Hotel and Spa restaurant serves a menu with many dishes using local, fresh produce. The garden room, lounge and bar are charming, relaxing spaces where guests can enjoy light meals or drinks. When would you like to stay at The Queens Hotel and Spa? This room with a bathroom has a TV, tea/coffee making facilities and a telephone, as well as free Wi-Fi. Private parking is available at a location nearby (reservation is not possible) and costs GBP 5 per day. Bedrooms with attached bathroom with TV, tea/coffee making facilities, telephone and free WiFi. These rooms have old style décor, obstructed room views and are positioned in noisy areas of the hotel. Customer service is one of the top priorities at The Queens Hotel and Spa, we aim to make each guests stay a relaxed and comfortable one. Being only a short walk to the beach and town centre yet being away from the hustle and bustle of the centre gives us the best of both worlds! House Rules The Queens Hotel and Spa takes special requests – add in the next step! A GBP50 damage deposit is required on arrival (around USD64.78). This deposit will be fully refunded at check-out, as long as there isn't any damage to the property. The Queens Hotel and Spa accepts these cards and reserves the right to temporarily hold an amount prior to arrival. The hotel advises that spa treatments are booked in advance, especially at weekends or other peak times. Please note, parking is subject to availability. We request all guests to enter their car registration into the tablets provided at the front desk, along with the number of days staying. This is due to our car park being monitored by a parking management company. A security deposit of GBP 50 is required on arrival. This deposit is fully refundable upon check-out. A damage deposit of GBP 50 is required on arrival. That's about 64.78USD. This will be collected by credit card. You should be reimbursed on check-out. Your deposit will be refunded in full by credit card, subject to an inspection of the property. Room was really noisy, above a disco. Moved to another room, bad condition, double bed but made up for 1, i.e. 1 towel, 1 mug. Paper thin walls could hear people next door watching telly at 6 in the morning. Paper coming off ceiling. Most staff were quite miserable. We have been in contact with the hotel, 2 weeks ago, and they said they were investigating our complaint. We have heard nothing since. Bad service. Breakfast was good. Location was good. Spa was good. The room was very poor, the wall paper was peeling off, the carpet was beyond cleaning and the element in the kettle was rusty and had to be replaced. The bed again like the rest of the decor was old and uncomfortable and the pillows the same. I ended up going into town to buy a pillow as even the replacement pillow I asked for was still thin and uncomfortable. Had it not been for the fabulous spa and treatments already booked I would have checked out the day I arrived. Sorry ! The staff service and food in the restaurant was excellent. I think we had one of the "old rooms" but it was a very good price. The noise from guests in adjacent room(s) and the banging from the heating pipes was very loud, so we struggled to get a good night's sleep during our short stay. Noise in the evening, due to very loud music and DJ. For the size of the party room, music and DJ did not need to be that loud. Also this was over 2 nights, Friday and Sunday. Ther seems to be no consideration for other customers in the hotel who were not at the parties. Bed was very uncomfortable as the mattress dipped in the middle, also floors in the room and other room were very creaking. Maybe needs updating in certain places as tiles were falling off in the jacuzzi/pool area. Good facilities, friendly staff and overall lovely hotel. Lift/elevator could look a little better. Bathroom needs a bit of attention (Décor).